Diabetes is a chronic health condition that can make it difficult for your body to turn food into energy. Like a car, your body need fuel to work. Food is fuel, but having diabetes can change how much and which types of food will work well in your body. When you eat, your body breaks down the food into a simple blood sugar, called glucose. Glucose is your body’s main fuel. Your cells use a hormone called insulin to absorb glucose. With diabetes, your body either doesn’t make enough insulin or doesn’t use insulin well. As a result, the glucose you need stays in your blood stream instead of going into your cells. When your body can’t get the energy it needs to function, your organs and tissues don’t work like they should. Just like in a car, improper fuel over an extended period of time can damage parts of your body, such as your kidneys, eyes and nerves. Further, diabetes can make it harder to fight infections and other illnesses. The number of adults with diabetes in Ohio has more than doubled in the last 20 years. Today, about one in four older adults have the disease, and the risk increases with age. The bad news is there is no cure. However, the good news is that diabetes can be successfully managed so that you can continue to lead an active and healthy life. The first step is to talk to your health care provider about diabetes. Ask about the risk factors. In addition to age, these include race, family history, being overweight and having low activity levels. Tell your provider if you regularly experience symptoms like increased thirst and hunger, dry mouth, unexplained weight loss, blurred vision, headaches, fatigue, nausea, irritability, wounds that heal slowly or reduced feeling in your hands or feet. Your provider may recommend blood tests to determine if you have diabetes. If you are diagnosed with diabetes, watching and managing your blood sugar levels will be your most important job. This can be challenging, which is why you should seek help. Your health care provider can recommend a diabetes education program. You can also take advantage of a HEALTHY U: Diabetes workshop in your community, sponsored by the Ohio Department of Aging and provided by your area agency on aging. • Manage any medications your doctor prescribes to manage your diabetes. 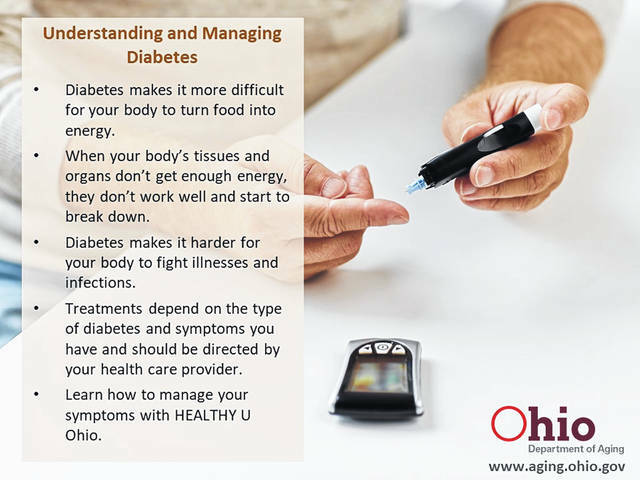 You can learn strategies to manage your diabetes on the Healthy U website (www.aging.ohio.gov/healthyu). To find a HEALTHY U: Diabetes program in your community, check out our online calendar (www.aging.ohio.gov/classes) or contact your area agency on aging by calling 1-866-243-5678. Submitted by the Ohio Department of Aging. The article was written by Health & Wellness Administrator Berrie Mabins, MSSA, LSW.